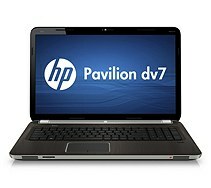 HP Pavilion dv7-6c80us offers great performance with the quad-core Intel Core i7-2670QM processor and 8 GB DDR3 SDRAM. The 750 GB 5400 RPM hard drive is equipped with HP ProtectSmart Hard Drive Protection. This laptop has a 17.3-inch Brightview LED-backlit display with a resolution of 1600 x 900 pixel and Intel HD graphics 3000. HP Pavilion dv7-6c80us is equipped with 9 cell 100 WHr Lithium-Ion battery, HP TrueVision HD webcam, card reader, two SuperSpeed USB 3.0 ports, HDMI port, two USB 2.0 ports, RJ -45 (LAN), VGA (15-pin), microphone-in, two headphone-out, 10/100/1000 Gigabit Ethernet LAN, 802.11b/g/n WLAN, and Bluetooth. For audio, it features Beats Audio with 4 speakers and HP TripleBass Reflex Subwoofer.